Congratulations America, we did it! 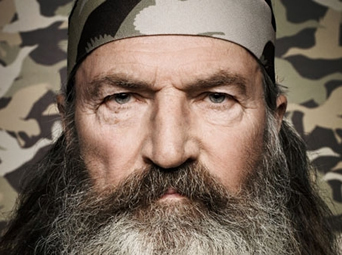 Thanks to your passionate push back, A&E networks rescinded its suspension of Duck Dynasty patriarch Phil Robertson. One thing to take away from the Duck Dynasty controversy is that no one knows enough or can predict the future well enough to be a pessimist. Conservative intellectuals (smart people) read negative political tea leaves which lead them to conclude that all is lost; Obama and his army of liberal socialist/progressives have all the power. They do everything right to further their agenda while we bumbling conservatives do everything wrong. I simply can not subscribe to negative predictions of the future. No one knows what tomorrow may bring. Secondly, 60 something years of living has taught me to trust God. Unquestionably, the arrogant elitist aggressors on the left were blown away by America rallying around Phil. Another unforeseen gift hidden in the left's feverish overplayed attack on Phil is that it has opened the eyes of millions of Americans to the truth that the left truly have launched a war on religious faith and traditional family values. Thanks to Phil holding firm to his beliefs, Americans are organizing to push back against the left's assaults on not just religious freedom, but liberty in general. Once passive Americans are joining the fight; signing petitions and more. In the midst of the left (NAACP, GLAD and NOW) rising up with pitch-forks demanding the head of Phil Robertson for quoting the Bible, I noticed that Kathy Griffin, queen of poking her finger in the eye of Christians will again co-host CNN's New Years Eve coverage. Ms Griffin told Jesus to “S*** it” in her Emmy award acceptance speech. Unlike the left's hysterical demands that Phil Robertson be fired, I am not suggesting that CNN not employ the services of Ms Griffin. I am merely shining the light of truth, exposing the left's blatant selective outrage and hypocrisy. Ask yourself folks, would Ms Griffin be ringing in the new year on CNN had her disrespectful comments been directed at Mohammed? I shutter just thinking of the consequences. So why has the left deemed it OK to dis my Lord and Savior, Jesus Christ? I ask, WDJD (what did Jesus do) to inspire such hate and disrespect from the left? Not to stray too far off topic, I just want to express my gratitude and excitement over the much needed shot in the arm that Phil's victory has given the Tea Party movement. And one last thing. Well meaning folks on our side have been criticizing Phil; his interpretation of scripture and so on. While such observations may or may not be true, there are a plethora of vicious left-wing pundits ripping Phil to threads with exaggerations, distortions and lies. Displaying manhood and backbone that has become rare in America, Phil courageously took a stand against political correctness for us; our principles and values. Therefore, I will not dare criticize him. I choose to view my Phil Robertson glass half full. Thanks again brother Phil. You are appreciated and respected more than you will ever know. I simply can not subscribe to negative predictions of the future.